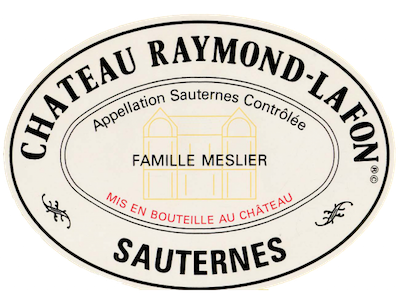 Chateau Raymond Lafon is located in Sauternes, Bordeaux, next to the vineyards of Chateau d’Yquem and very close to Chateau Suduiraut. It was founded in 1850 by Raymond Lafon, and was inherited by Louis Pontallier, a nephew of Lafon’s, whose grandson, Paul Pontallier, is the director of Chateau Margaux. Pontallier sold the chateau in 1952 to the Bourdier family, from which the current owners, the Meslier Family, (Pierre Meslier was the then managing director of Chateau d’Yquem) acquired it in 1972. The association and the proximity to Chateau d’Yquem explains why Raymond Lafon is produced in the exact fashion with the great sweet wine of Bordeaux. The tiny 18 hectare vinayard is planted to 80% Semillon and 20% Sauvignon Blanc with vines that average 40 years of age. The wine spends 3 years in 100% new French oak barrels.